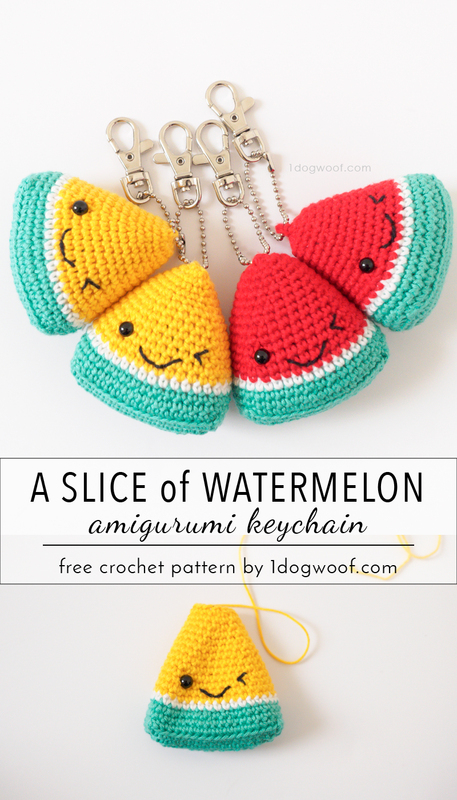 Welp, it’s been 3 months, and I’m finally publishing the pattern for my Watermelon Amigurumi Keychain. 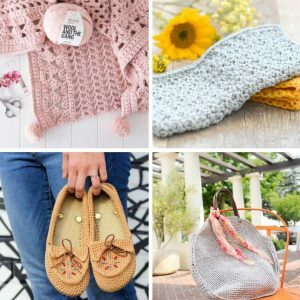 It’s a simple project and makes for a great teacher’s gift, whether you give it at the end of a school year like I did, or at the beginning of the year, or for the holidays as a stocking stuffer. It’s cute, it’s small, and you can whip up a batch of these in an evening for all the people on your list! This post is supported by an ongoing collaboration with Lion Brand. All opinions, text and photos are 100% my own. So, back in May, I needed gifts for J’s school teachers. I thought now that he’d entered Kindergarten, I’d only have to come up with 1 gift at occasional times of year, but he’s in an After School program since both my husband and I work, and there’s a whole group of awesome teachers and caretakers that I wanted to show my appreciation for. Of course, the quickest and easiest gift is to grab a handful of gift cards from my local Target or Starbucks, but c’mon, I’m a blogger and should be a little more P’interesting, right? Not that gift cards are bad, especially if given in a cute gift card holder, but I gifted the Snowman Gift Card Holder at Christmas and I can’t rightly do it again. Plus, I needed 7 of them, so what better way to bring on the summer than with little smiling slices of watermelon! Are you familiar with yellow watermelon? 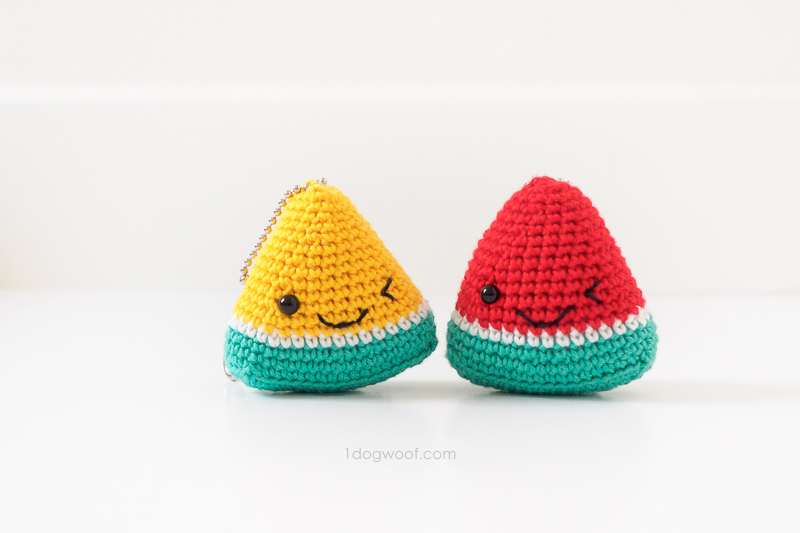 I realized that not everyone grew up knowing there is such a thing as a yellow watermelon, so the yellow keychains didn’t go over as well as the red ones, although I personally think they’re cuter, but I’m a sucker for yellow. The watermelon slices are made using Lion Brand BonBons in Beach, which is a lightweight cotton yarn that is super useful for little projects like my Goldfish Teether. I also like using the Black BonBon as a replacement for embroidery thread for all sorts of things. I always keep a pack or two of Beach’s bright, primary colors on hand. With 1 package of BonBons in Beach, you can make at least 1 red and 1 yellow watermelon. The watermelon is worked in rounds and sewn together at the top. I didn’t leave a loop for a keychain, and just pushed a ball chain through, and then attached a lobster clasp on top. This was the most lightweight and inexpensive keychain option I found. You can purchase them on Amazon through my affiliate links here and here. 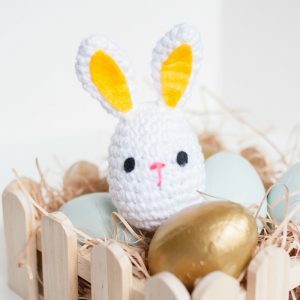 I made these for the summer, but as we head into craft fair season, I think they would sell great as stocking stuffers too! Gauge doesn’t matter on this project, as long as it’s tight enough to prevent the stuffing from coming out. 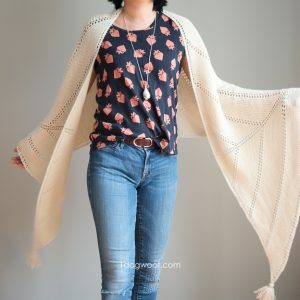 Pattern is worked in seamed rounds. First st in each round is worked into same st as join. Round 1: (in GREEN) Ch 14. Work 1 sc into the 2nd ch from hook. Work 1 sc in each of next 11 st, [1 sc, 2 ch, 1 sc, 2 ch, 1 sc] in next ch (this turns the corner), 1 sc in each of next 11 st, [1 sc, 2ch, 1sc, 2 ch] in last ch. Join to first sc with sl st. Round 2: Ch 1. Work 1 sc in each of next 13 st, 1 corner in ch 2 sp, 1 sc in next st, 1 corner in ch 2 sp, 1 sc in each of next 13 st, 1 corner in ch 2 sp, 1 sc in next st, 1 corner in ch 2 sp. Join to first sc with sl st. Round 3: Ch 1. Work 1 sc in each of next 14 st, 1 corner in ch 2 sp, 1 sc in each of next 3 st, 1 corner in ch 2 sp, 1 sc in each of next 15 st, 1 corner in ch 2 sp, 1 sc in each of next 3 st, 1 corner in ch 2 sp, 1 sc in next st. Join to first sc with sl st. Eye – Insert safety eye between the 3rd and 4th red rounds, 2 st to the right of the sc2tog st.
Wink – With black yarn, insert needle from inside out, between the 2nd and 3rd red rounds, 2 st to the left of the sc2tog st (starting point). Insert the needle outside in, between the 3rd and 4th red rounds, approximately the same width as the safety eye (middle point). Insert the needle inside out, between the 4th and 5th red rounds, directly above the starting point (end point). Insert the needle outside in, at the middle point, to complete the wink. Smile – Embroider on a smile centered and just slightly below the eyes. ** Stuff the watermelon firmly to fill out the shape. 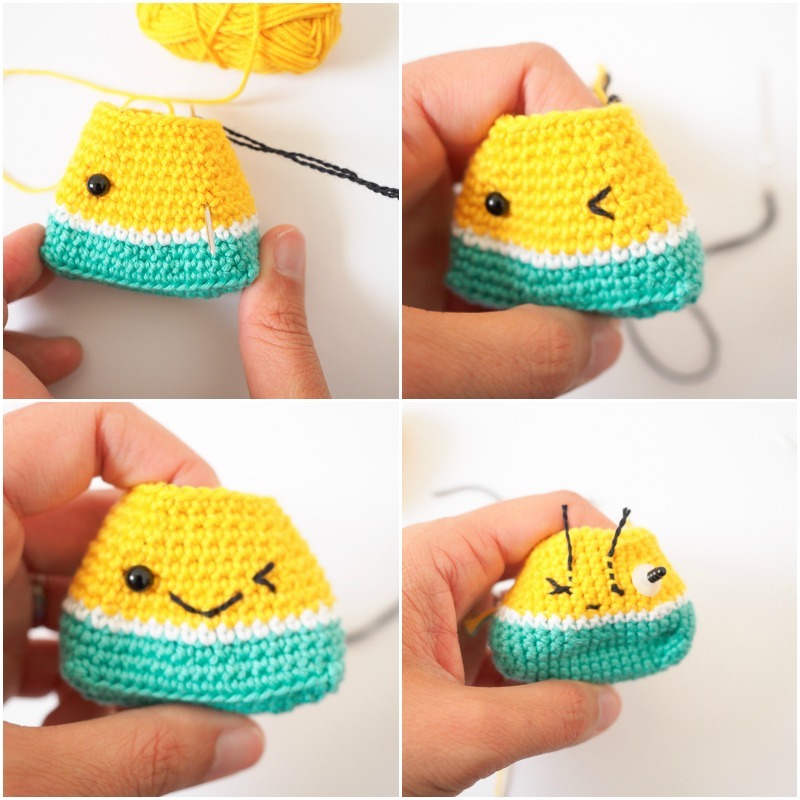 Cut yarn, leaving a tail. Squeeze the round together, aligning the 4 sc to the 4sc. 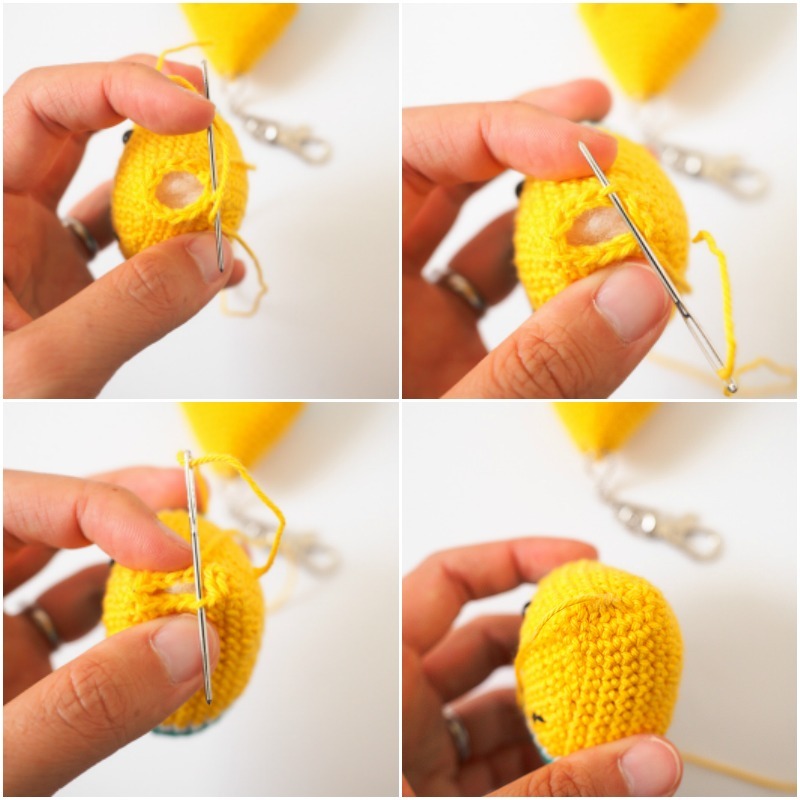 Use the mattress stitch to close. Fasten off and weave in ends. Insert the ball chain clasp through any available stitch on the top of the watermelon. I used a needle to help things along – it takes some effort, but you can always find a small gap to get the chain through. Once the chain is attached, just close the ball chain around a lobster clasp and you’re all set! 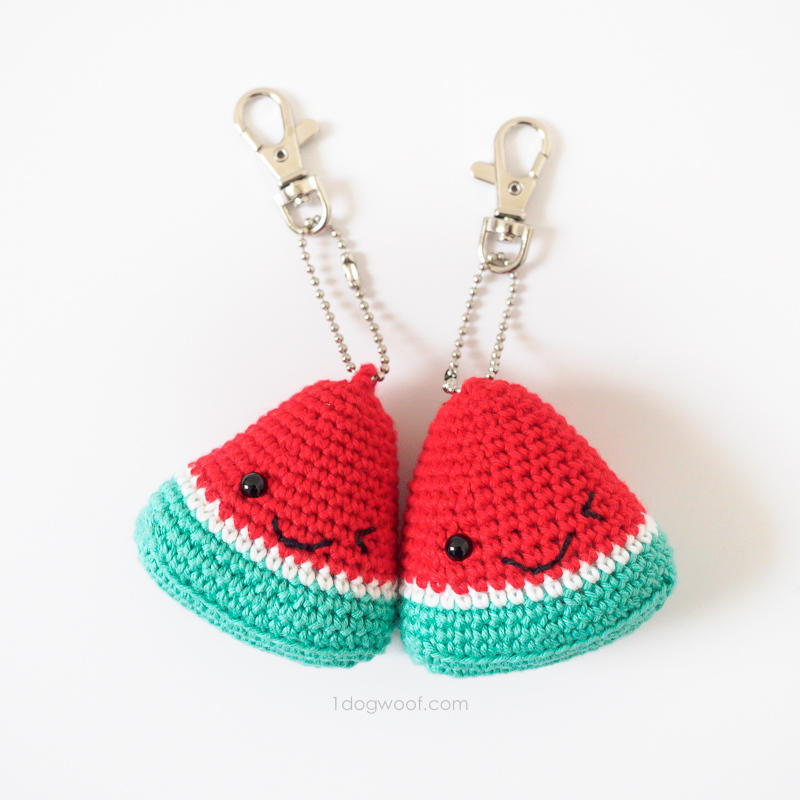 On my first keychain, I created a loop at the top of the watermelon to insert the ball chain, but it looked a bit weird, so I adjusted to insert the ball chain straight through the top of the watermelon instead. Please share your watermelon slices with me on Facebook (One Dog Woof) or Instagram (@1dogwoof)! Remember to tag your post with #1dogwoof! These are just too darn cute. Love them. These are so darn cute! I love yellow watermelon, then again I love all melons!! lol Thanks for sharing!! the yellow melons are called Champagne Melons in Australia. You could turn these into candy corn too! Love the idea! Thank you for the beautiful pattern. 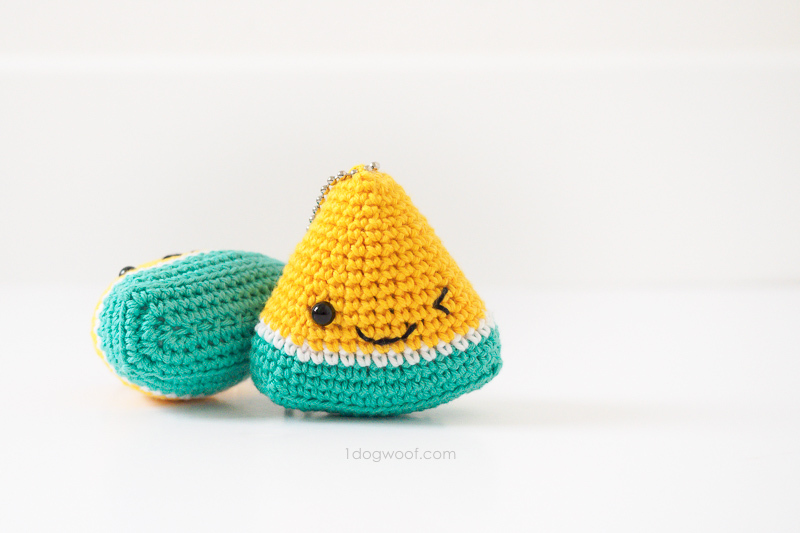 if you want to make a small pillow, can I double the amount of stitches? Is it okay? Gosoaria de receber receitas de chaveiros. My Ch 1 at the beginning of rounds do not count as a stitch, and the slip stitches to end rounds are worked into the first sc, not the ch 1.